A new ultra-versatile commercial version of the Land Rover Discovery will go on sale in the UK today. Featuring 1,856 litres of flexible load space replacing the second and third row seats, the new Discovery affords driver and passenger premium levels of comfort and entertainment. Available with Land Rover’s Ingenium 2.0D SD4 240HP and 3.0D TD6 258HP engines, Discovery Commercial shares the fundamental underpinnings of the Discovery, from its wide-spaced double-wishbone design at the front to its advanced multi-link layout at the rear, the Discovery Commercial’s suspension delivers more responsive handling without compromising Land Rover’s hallmark all-terrain capability and makes all journeys confident, comfortable and engaging. Discovery Commercial comes exclusively with four wheel drive, automatic transmission, twin-speed transfer box, air suspension and a full-size spare wheel. Fitted solely with Discovery’s front row seating; driver comfort and convenience remain unchanged with InControl Touch Pro featuring as standard. The second and third row seating have been replaced with 1,856 litres of hard-wearing load-space. Accessed by a powered tailgate and benefiting from Discovery’s innovative powered inner tailgate, Discovery Commercial’s load-space measures 1,635mm long, 939mm high and 1,411mm wide. The boot aperture is large enough to accept loads measuring up to 1000 x 735mm. Discovery Commercial comes with Land Rover’s unique Terrain Response systems which optimise the vehicle’s engine, gearbox, centre differential and chassis systems to match the demands of the terrain. Optional Terrain Response 2 system enhances this even further by monitoring driving conditions and automatically selecting the driving modes ensuring loads are delivered whatever the terrain, whatever the weather. Retaining the exterior design of Discovery, rear window concealment panels are masked by privacy glass so Discovery Commercial can be undistinguishable as a commercial vehicle if desired. To launch the Discovery Commercial, Land Rover teamed up with Bloom & Wild, experts in packaging and delivering fresh flowers to letterboxes across the country. 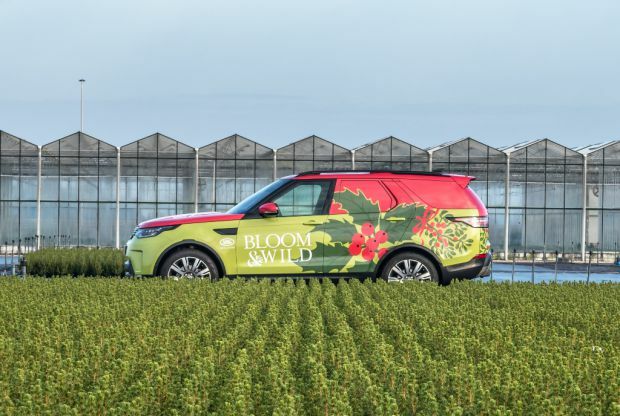 The new Discovery Commercial, wrapped in Bloom & Wild livery hauled 300 mini Christmas trees back to the UK from their farm in the Netherlands in time for the festive season. Priced from £48,695 on the road (VAT at £8,066.67), Discovery Commercial is available in S, SE and HSE available with both 2.0 SD4 and 3.0 TD6 engines.